Sign up for Broadjam today to follow Michael Laechel, and be notified when they upload new stuff or update their news! 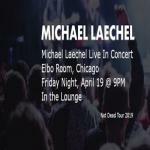 Add to Calendar 19-04-2019 21:00:00 19-04-2019 21:00:00 11 Michael Laechel's Event Excited to make my first appearance back at the Elbo Room in Chicago in 3 years!! Friday night, April 19th. 9-10:30. Hear a collection of new and old songs written over the years. Feel the energy and the joy of a live performance!! Hope you can make it. Bring a few friends. 5 bucks at the door. Show 9-10:30 2871 N Lincoln Ave.